This rare genetic disorder involves two defects. First, the Aortic Arch does not form a complete tube and is divided, or "interrupted" (see upper arrow in diagram). The aortic arch is the part of the aorta (the major vessel that carries oxygen-rich blood from the heart to the body's tissues) that curves directly above the heart and begins the descent to the lower body. 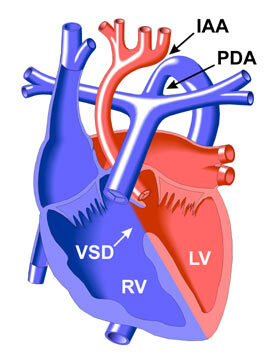 Second, there is a hole, called a Ventricular Septal Defect (VSD in diagram), in the muscle wall (septum) that separates the two ventricles, or pumping chambers of the heart. The pulmonary artery normally carries oxygen-poor blood to the lungs, so it might seem that blood entering the lower aorta from this vessel (through the PDA) would not carry enough oxygen to the lower body. However, in this case the Ventricular Septal Defect (VSD) allows mixing of oxygen-rich blood from the left ventricle into the right ventricle, which pumps blood into the pulmonary artery.